IBASSIN: 2017 Walmart FLW Tour Potomac River Day 3: Tom Monsoor Stills Leads with 51-09llbs! 2017 Walmart FLW Tour Potomac River Day 3: Tom Monsoor Stills Leads with 51-09llbs! Tom Monsoor’s game plan didn’t change, nor did his place in the standings. His mindset and optimism sure have, though. Don’t be mistaken; Monsoor is excited to be leading after catching 15 pounds, 5 ounces on day three of the FLW Tour on the Potomac River presented by Costa Sunglasses. 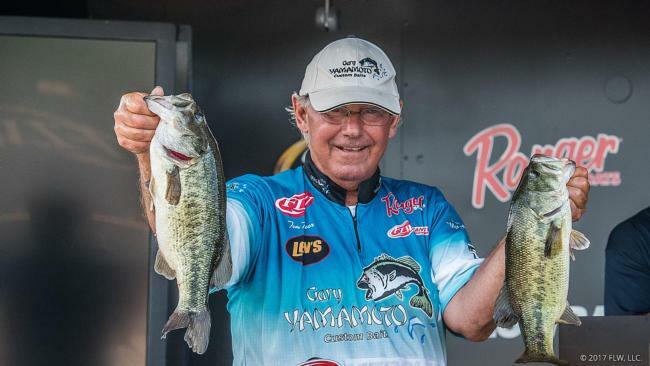 The long-time pro from La Crosse, Wis., has never won a Tour event, and after watching Bryan Schmitt win the last event on Monsoor’s home waters, he’d enjoy returning the favor. That said, his once-sizable lead has dwindled to a mere 2 ounces over Brandon McMillan of Clewiston, Fla., in large part because a key part of his game plan failed him Saturday, and that has him concerned for tomorrow. Monsoor has been running a two-area pattern based around the tides, and he did so again Saturday, starting on a 200-foot-long grass bed where every morning he’s sacked up a quick limit. That part held true again Saturday, as he switched between his notorious swim jig and a swimbait to catch roughly eight keepers, with two of them being good ones. At 8:30 a.m. he pulled the plug to go to his big-fish area – a 100-yard grass bed just south of takeoff. For the next 6 hours Monsoor soaked his swim jig in that area, catching only four keepers. Two did cull him up a little, but it was far from what he’d come to expect from the area where he’d been able to make significant upgrades the first two days. The lackluster bite confirmed what was his lone fear about the area: that it may have been beaten up too badly by fishing pressure the previous days. Monsoor hasn’t entirely ruled it out for the final day, but he’ll probably relegate it to a last resort. A key thing to note is that he actually considered skipping his “limit” spot today in order to go straight to his big-fish spot. At the last second he decided to keep things the same. As for his Sunday plan, he says he’ll have to “give it some thought.” There’s little doubt he’ll milk his limit spot for all it’s worth, but after that, he’s not sure. He has three areas he hasn’t hit, one in particular he will have to at least try. “I’ll have to watch the tide, but there’s one spot where I caught a big one in practice,” says Monsoor. “It looked like there’s a school there, but it’s not a weedbed. It’s just a weird spot, and I’m not sure I trust it.